The polls missed one thing in 2011: the Conservative majority. On average, they understated Conservative support by 3-4 points. That was enough to turn a minority into a majority government. They did well otherwise, capturing the surge in Quebec. In fact, despite all the turmoil in Quebec, the polls were bang-on in the province. When it comes to misses, I think the question to ask is why the polls missed it. There's always a reason behind it: a late swing in Alberta in 2012? The difference between voters and non-voters in B.C. in 2013? For this election, I think it will come down to turnout. Which party will get their voters to the polls, and which voters are most likely to vote? The Conservatives continue to have an advantage among older voters, who vote in bigger numbers. If that holds, the Tories could end up a little higher in the actual result than the polls are currently showing. So - keep an eye on those numbers among older voters. The riding projections are based, primarily, on regional information. So while they can give a good idea of which party is in play in which riding, and which ridings one party or another is favoured in, there is still a big margin for error in those projections. If people want to use them for strategic voting, they should only be a starting point. People should trust in their own eyes and ears locally as well. Yes, and in both cases it is the NDP. The New Democrats tend to be the Greens' top second choice. And that is also the case for Bloc voters. The Greens can also draw support away from the Liberals, but in lesser numbers. Polls are always snapshots of the past, so there is always a lag. Even Nanos's daily tracking polls are done over three days - so you need to wait at least that long to see anything changing. There is also the issue that events and debates are covered and dissected by the media after-the-fact, so then that increases the lag. People who don't watch a debate on Thursday may only read the analysis of that debate by Saturday. A good rule of thumb? About a week. I'm not sure about a wave. Quebecers are very familiar with Stephen Harper and the Conservatives, and support for them has never been much higher than 25% in the province at the best of times. But the Tories don't really need a wave. If they can get up to 20% or 25%, with the NDP dropping to 30%, that can move a lot of seats - and make up for the losses that are very likely to happen in Atlantic Canada and BC. I think that can happen, and might have been one of the factors behind the miss in BC in 2013. Exit polls showed that most BCers thought the NDP was going to win, including a lot of people who voted for the BC Liberals (who actually did win). But it cuts both ways. People like to back a winner too. It is not a good thing when polls that parties leak are reported on as fact in the media. But other polls, commissioned by the media or published by reputable pollsters who don't do partisan work, is good for democracy in the sense that it is information people can decide to use or not. Our democratic choice is not the sum of individual choices. We make our decisions as an entire community. People ask their friends, co-workers, and family about who they'll vote for. A poll is just the equivalent of having that conversation nationwide. That is a complicating factor, definitely. But Elections Canada calculated what the 2011 results would have been on these new boundaries, so it is possible to use that as a base from which to make an estimate on likely outcomes. I've had to tackle this issue in some provincial elections as well, and it didn't have much of an impact on accuracy. Thanks, Éric, for your time. We appreciate it. Thanks! Great questions everybody. It will be fun to watch what will happen on Oct. 19! CBC analyst Ãric Grenier tracks party support to project who could win the 2015 federal election. 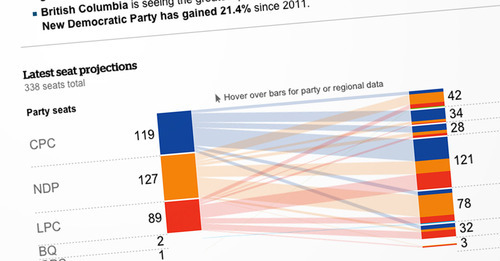 Follow the race to the finish line with Poll Tracker and explore the latest numbers region by region and poll by poll. A re-elected Conservative government could end up approving the construction of as few as 11 warships to replace the navy's frigates, despite committing to 15 combat vessels under their $36 billion national shipbuilding program. Canadian Surface Combatant ships, which are intended to replace not only the existing frigates but also the navy's command and control destroyers. Kenney says the government intends to build anywhere between 11 and 15 frigate replacements. Kenney says the program is still years down the road and a future government will have to decide how many ships to build -- or whether to put in more money. But he indicated there might have to be "trade-offs" and applauded the navy for considering the idea of reusing parts from the frigates on the new warships whenever they arrive. Apologies. We missed the meat of NDP candidate Peter Julian's announcement about the party's plan for voter rights. When we have the information, we'll add it to the live blog. No. It's in a TVA studio. Hi, everyone. We're here with CBC reporter James Fitz-Morris to discuss tonight's French-language debate and the election campaign as a whole. Hi, James. Thanks for doing this. My pleasure! It's going to be an interesting night. Most to win tonight, realistically, is Gilles Duceppe. The Bloc come into this with almost nothing and are looking to get back into the race. Tom Mulcair seemed to be the main target during the first French-language debate. Do you expect the same tonight?